Ombré patterns have been everywhere as of late. The French word ombré means "shaded," and in fashion it refers to pretty much anything that starts out one color and then slowly morphs into another. We've weathered trends for ombré hair, ombré clothes, ombré fur — last summer I even showed you how to ombré dye a scarf. So why not ombré nails? They're easier than you'd think. Left and center: Jen Kao presented gorgeously gradated ombré manicures in green-and-black, blue-and-black, and green-and-black at her spring-summer 2012 show. Right: Parkchoonmoo showed a slightly more expressive, less airbrushed-looking ombré manicure in putty and aubergine with her spring collection. You'll need, from left: a base coat of your choice (I think Nail Envy by OPI is okay), two colors for your ombré, a top coat (Sally Hansen's Insta-Dri is misleadingly named but still the best), nail polish remover, nail clippers, and a makeup sponge. The first step, as always, is to clean and trim your nails, push back your cuticles, and swab each of your nails with polish remover to remove any traces of oil or other contaminants that might affect the adherence of your manicure that might be present. (See here for more detailed tips on manicure prep and how to make a polish job last.) Once that's done, apply your base coat. We're going to create an ombré pattern by laying down a base color and then layering a contrasting color over the top with a makeup sponge. Apply that base color, concentrating on making sure it's opaque — but only towards the base of your nails. At the tips, the contrasting color will cover any streakiness. Once your base color is dry to the touch — and waiting is crucial, trust — dab a tiny amount of your contrasting color on the tip of your makeup sponge. Smoosh it all over the tip of your nail, taking the contrasting color down towards the halfway zone. I found that the makeup sponge quickly became crispy with dried contrasting color, so I kept a pair of scissors handy to snip off the used surface and reveal fresh sponge beneath. Applying the contrasting color with fresh sponge gives a more even color and allows for a more subtle gradient. If you find you've gone too dark too quickly, just use the sponge to dab on some of your base color. Add the contrasting color in layers, building up depth towards the tips of your nails. You can see from this photo that two of my nails are done but the middle finger is still in the intermediate stage. Don't worry about getting color from the sponge on your cuticles and surrounding skin. When you're done, use nail polish remover to clean up your fingers (or just peel off the unwanted polish in the shower). 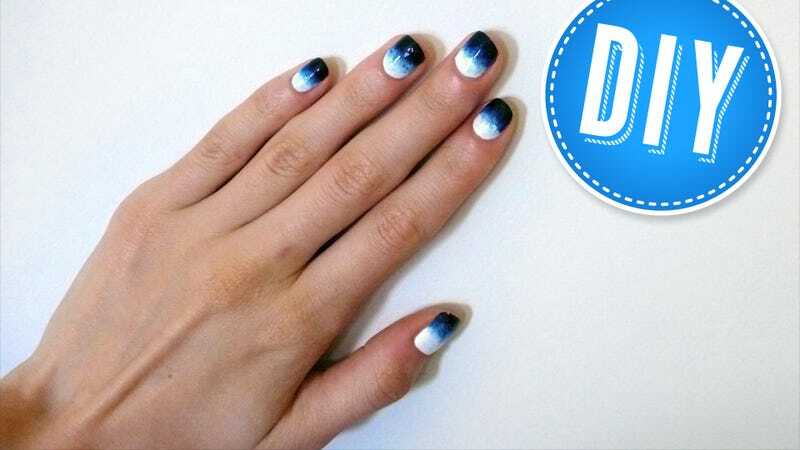 Add your top coat. Because top coats have a way of picking up color with each stroke, apply your top coat in lateral strokes across the nail to avoid smearing contrasting color all over your base color and vice-versa. Here's how mine looked when I finished. It might take a bit of practice to get the sponge-application method down — but the results sure are eye-catching.